I’m over at the Apex blog today talking about “The Young and the Darkness”, otherwise known as Things I am Accused of Being that are Assumed to be Mutually Exclusive. We go into the short stories and poetry I loved as a child…and the short stories and poetry I write now, including my short story collection WILD & WISHFUL, DARK & DREAMING. Okay…not *everything*. But I am happy to report that I have more than one work this year eligible for award nominations! Yay! 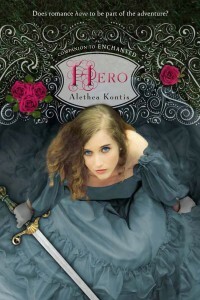 HERO (Fantasy, YA) — Second in the Woodcutter Sisters series of fairy tale mash-up novels. (Think “Once Upon a Time” meets “The Princess Bride”) Saturday Woodcutter is a girl with a sword who is mistaken for a boy through the whole book. She has to rescue Peregrine of Starburn (mistaken for a girl through the whole book) from a witch and a dragon. IT’S AWESOME AND FUN. There are a handful of original short stories from my WILD & WISHFUL, DARK & DREAMING collection that just released from Alliteration Ink. I will list them all here, starting with my top choice, and what categories they would fall under (depending on which Awards you’re nominating for). * “The Were Four” (SF/F, YA) — On Dec 21, 2012, the world didn’t end. Instead, 90% of the people on Earth became a were-creature of their totem animal. This is the story of four high-school aged, misfit, REALLY LAME weres (platypus, piranha, sloth & mosquito) who enter a local Battle of the Bands. * “Blood, Sweat & Tears” (Contemporary, Horror) — The story of a young Romany woman who ghostwrites bestselling novels with a magic potion literally made of of blood, sweat, and tears. * “183 Million Light Years from Home” (SF) — A tired young father on a dark, nearly-deserted stretch of TN highway accidentally kills a stranger…and saves the world. * “Confessions of the Ex-Future-Mrs. X” (Fantasy) — A secret, in-depth interview with the woman who almost married Willy Wonka. * “Deathday” (Fantasy, Poetry) — A dark love letter to the soul of a girl’s mother on the day she was born.